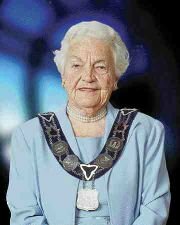 A nice big picture of Hazel McCallion so people can know it is the Queen of Sprawl's doings that we are in this mess! After all of all the people who sit on City Council, she has been there the longest and has had her hand in all the decisions that have lead to the problems that plague us today. Does any one know how to fix Mississauga's transit problems? Yes - click here. Mississauga - Mississauga is unlikely to ever have a truly efficient public transit system, because the city wasn't developed with that in mind, admits Mayor Hazel McCallion. "Back in 1974 we allowed a lot of cul-de-sacs and winding roads to be built. They're beautiful for residents to live and drive around in, but difficult for buses. That's the problem," said McCallion. The mayor was responding to a staff report, presented to General Committee Wednesday, on initiatives to promote ridership on Mississauga Transit. These include introducing a transit pass for University of Toronto at Mississauga (UTM) students, actively marketing the upcoming GTA farecard and pushing forward with the long-delayed Bus Rapid Tran-sit (BRT) project along the Hwy. 403/Eglinton Ave. corridor. While the initiatives were well-received by McCallion and councillors, they weren't as sanguine about the overall future of public transit in the city. Standing in the buses' way, literally, are too many cars. "No matter how many buses we put on the road, they're going to have to fight with cars," said McCallion. Ward 4 Councillor Frank Dale noted it can take up to two hours to travel across the city. "Short runs are okay, long runs are not. I understand why people with cars will use them," he said. Dale had some good news for commuters. After a flood of complaints, GO Transit is going to provide parking at its new Square One hub. Construction on the 200-car lot should be completed by next spring, he said. While Mississauga Transit stacks up well against systems in suburban municipalities, it still has a long way to go before it matches the level of service provided in downtown Toronto, said Transit Director Bill Cunningham. "It's an unfair comparison...we're not at their stage of evolution," he said. A ridership survey conducted last April shows 40 per cent of non-riders would consider using Mississauga Transit if there was a bus-only transit lane along Hwy. 403 to Kipling subway station, if they were provided with employer-subsidized passes and if there were bus-only lanes during rush-hours. Ward 9 Councillor Pat Saito, however, isn't in favour of building more bus-only lanes because they're not used frequently enough. "They have to be busy, otherwise it's one lane taken away from regular traffic," she said. High occupancy vehicle (HOV) lanes, such as those along Hwy. 403 through the city, do not work either because most of the time they're standing empty, said Saito. According to the study, ridership growth will come mainly from three groups: secondary school students, GO Rail riders and GTA residents entering Mississauga for work.